Tag line: "They're here and they're hungry"
If there was a Hall of Fame for micro-budget monster movies, 1983’s The Deadly Spawn would be one of its first inductees. A fast-paced, gore-fueled sci-fi / horror flick about carnivorous creatures from outer space, this film is fun with a capital “F”. It all begins one night when a meteor comes crashing to earth. 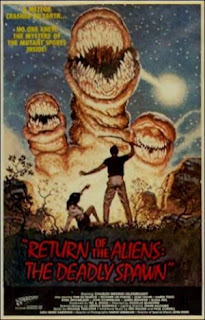 Two campers (Andrew Michaels and John Arndt), who witnessed the event, decide to investigate, only to be attacked and killed by a man-eating, worm-like creature with enormous teeth. From there, this otherworldly monster makes its way to a nearby home, where it crawls into THE basement through an open window. The next morning, the owners of the house, Sam (James Brewster) and Barb (Elissa Neil), rise early, and quickly become the alien’s newest victims. The rest of the house’s occupants, which includes the couple’s two sons Pete (Tom DeFranco) and Charles (Charles George Hildebrandt), as well as Aunt Millie (Ethel Michelson) and Uncle Herb (John Schmerling), who are visiting for a few days, wake up later and assume Sam and Barb got an early start on their planned day trip. It isn’t until young Charles goes down in the basement that the truth is discovered. What’s more, the creature spawned during the night, resulting in hundreds of smaller worms that are every bit as hungry as their “mother”! While Charles, who also happens to be a fan of monster movies, continues to search the basement for clues, life goes on as usual upstairs. Pete, a college student, invites his classmates Ellen (Jean Tafler), Frankie (Richard Lee Porter), and Kathy (Karen Tighe) over for a study date, while Aunt Millie heads to her mother Bunny’s (Judith Mayes) house to help her prepare for a luncheon. It won’t be long, though, before each of them encounters the new “babies”, which seem to be multiplying by the hour. The question is: can these creatures be stopped? The Deadly Spawn moves along at a brisk pace (its hour and a half runtime flies by), and the performances are better than what you’d find in most low-budget horror movies (the scenes with Pete and his classmates are especially good). Best of all, though, are the special effects, which were overseen by John Dods. The creature, with its gaping mouth and hundreds of teeth, reminded me of those monsters you’d find in ‘50s sci-fi films, while the “baby” aliens took on several forms (they start as wiggling little worms, and grow from there). In addition, there were several very convincing gore scenes. When Charles is in the basement, he spots his mother’s severed head, slowly being devoured by the baby aliens; and later on, Bunny’s luncheon is interrupted by dozens of these otherworldly tykes, one of which attaches itself to her head!